The Women's Endurus TR Shoe from The North Face is a great option for active low level hikes in dry conditions. It combines a soft ride with dependable stability and excellent breathability. The forefoot to midfoot ESS Snake Plate offers security against uneven terrains, in particular pointy rocks and hidden tree roots. 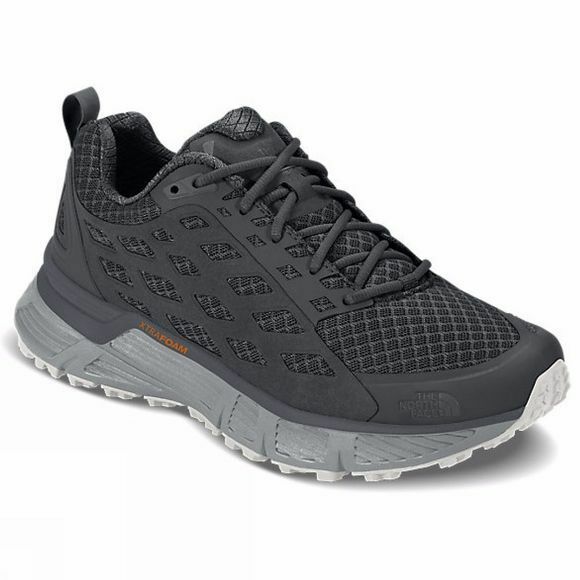 A unique Endurus midsole features a soft-density foam underfoot with the enhanced stability around the perimeter for the midsole to reinforce confidence and comfort whether you are on or off the beaten track. The Vibram XS Trek outsole will see that you stay upright throughout your journey. Named for the coldest, most unforgiving side of a mountain, The North Face has a rich tradition of sponsoring expeditions to some of the most remote corners of the globe. And it’s through these expeditions, and in conjunction with the elite athletes, that they’ve been able to develop an extensive line of hard-wearing performance apparel, equipment and footwear, helping to make The North Face the first choice for endurance, trail and road runners the world over.